And when you come to us, you’ll be treated like a person. Your warm, friendly experience won’t end after the reception area. It won’t end after the introduction. In fact, you’ll soon feel so comfortable you won’t even know you’re in a dentist’s office. Of course, part of making you comfortable is making your visit as pain-free as possible. We know that dental procedures can be scary, and the last thing that you – or your children – need is a bad dental experience. Our professionals help you to feel relaxed. And, for all our procedures, you’ll have free access to Nitrous Oxide – a safe, quick acting gas that helps control pain and anxiety. You can have access to all of this no matter who you are, how long you have been a patient, or what procedure you require. Our team has experience providing excellent, comfortable care for anyone from small children to seniors. Our previous facility was no longer able to accommodate our growth, so we built and moved into a new facility. We treat everyone as a person, we’re not going to rush appointments and process people faster. We give everybody the personal treatment they deserve. 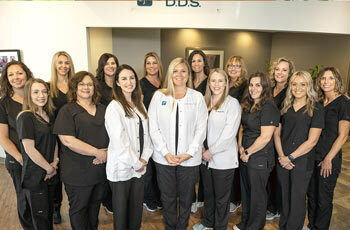 Call or contact us today if you are interested in the Sarah Palmer DDS team experience.